When our Casavant pipe organ console was renovated during the summer of 2011, it was wired for 3 additional stops to be completed at a later date. The estimate that we had in January 2015 to complete these stops with the necessary new pipe work was around $53,000. The Trustees and Church Council voted to put this project on hold for at least 3 years because of more pressing renovation issues around the church. 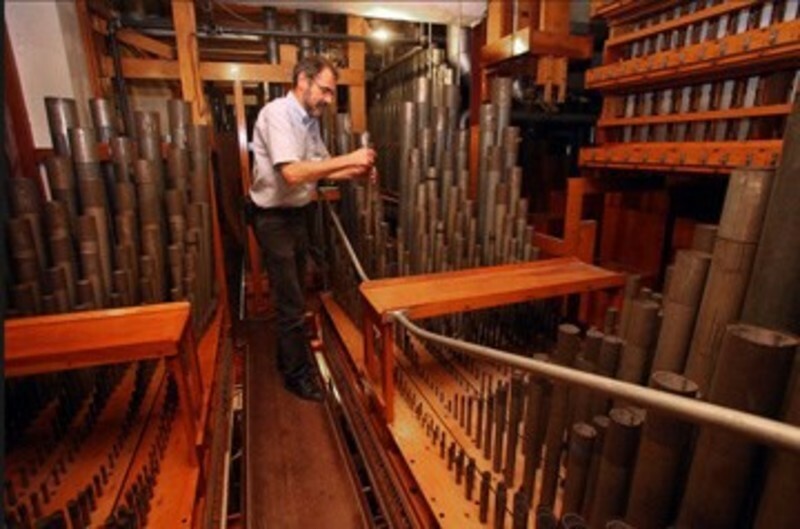 This past fall, Michael Proscia, our organ tuner/technician from Bowdon, Georgia, contacted Tommy Bishop and said that he had located the 2 ranks of pipes that we needed to complete these additions. These pipes were from an early 1970’s Reuter pipe organ (still in good condition) which he had serviced for many years. This organ was being dismantled, and he told Tommy that he would be willing to donate the pipes needed, if our church would pay the cost for labor/installation and other materials which would be $7,000. The Church Council voted to proceed with this project immediately as a result of the tremendous savings due to Michael Proscia’s generous offer! Michael and his helper, George, began with this work with several visits to Union during November, December, and January. The additions are now complete and include the installation of 134 additional pipes with chests, wind lines, wind reservoir, an additional blower to power the 2 ranks of pipes, 3 engraved stop rocker tabs, additional circuit boards (unit chest drivers) inside the console, and some complicated electrical wiring under the choir loft floor from the organ console to the pipe chambers. The 3 additional stops include a Flute 8 (extension of Subbass 16) for the Pedal division, and an Erzahler Celeste 8 and a Trompette 8 for the Great division. Also, at Tommy’s request, Michael installed a Cymbelstern, operated by a thumb piston, which provides the sound of tinkling bells. This device was also from a previous organ, so there was no additional cost. A reversible thumb piston was also installed to transfer the Trompette 8 from the Great division to the Swell division if desired. Now the organ has 24 stops instead of the original 21 and 30 ranks with 1,610 pipes instead of the original 28 ranks with 1,476 pipes. Our Casavant pipe organ was installed during the summer of 1968 at a cost of $35,900 and now, 48 years later, is valued at over $500,000! For more details or for a demonstration of these additions, please contact Tommy Bishop.